Difference between B&B and Airbnb? Hospitality, professionalism, breakfast! Make no mistake about it. An Airbnb is not a bed and breakfast. Interestingly, the Airbnb concept chose the name because of all benefits and positive images that B&Bs conjure up. Yet, beyond the name, there are few similarities between a B&B and an Airbnb. While the members of Distinctive Inns of New England are technically inns, the only real difference between an inn and a B&B is the size, generally. And when it comes to romantic New England getaways, which kind of lodging property do travelers turn to? They turn to Distinctive Inns of New England and other B&Bs as the number one choice for romantic escapes. For years hotels, motels and other lodging brands have stolen terms from the B&B industry. Who do you think offered the first Heavenly Beds? It wasn’t Westin! And what business offered breakfast with a stay long before the concept of self-cooked toasters and frozen waffles were introduced at hotels? B&Bs of course – breakfast is half their name! America’s lodging industry has turned to the B&B industry time and time again to garner clues on hospitality and then to emulate them. So, when is a B&B not a B&B? When it’s an Airbnb! Let’s take a good look at what makes a B&B stay stand out among today’s lodging choices. 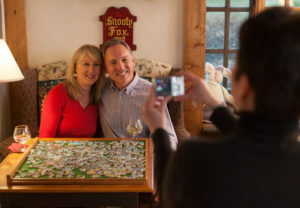 Professional innkeepers/Personalized stays: B&Bs offer hosted stays offered by a professional innkeeper who is well-versed in the special aspects of their area and in making guests feel welcomed. Personalized hospitality is the hallmark of the bed and breakfast industry. Too many Airbnbs are unhosted buildings, offering a note of welcome, not a hug, handshake or tour, and a brochure rack of attractions in the area, not a well-planned personalized itinerary from the B&B innkeeper in-the-know on best places. When you arrive at any of the Distinctive Inns of New England, you may meet the innkeeper for the first time, but you’ll always leave a friend! Life-safety licensed: B&Bs are bound by local zoning and life-safety regulations that Airbnbs are not required to follow in almost all communities. This means that B&Bs must undergo regular health and safety inspections while Airbnbs are widely unregulated. Fire suppression, air quality, cooking equipment and structural regulations must be followed in order for B&Bs to attain a license. This is not the case for Airbnbs. Because they’re the newcomers to the scene, many communities are still struggling with how to monitor safety and licensing issues for Airbnbs. This leaves the responsibility for safety and security up to the owner. We hope they are conscientious about safety issues, but travelers can’t be assured that all regulations have been followed like they can when they stay at a B&B or inn. Where would you feel safer? Certainly, at a licensed lodging property! Breakfast! Visit a licensed B&B and often the highlight will be your scratch-cooked breakfast. 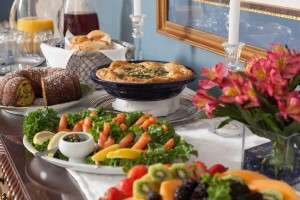 Since breakfast is half their name, B&B innkeepers are well known for their sumptuous breakfasts. While the second “B” in Airbnb could stand for breakfast, it commonly is not part of the deal. Airbnbs are shared spaces or homes, and while some Airbnb owners add on a breakfast to the stay, most do not. They say breakfast is the most important meal of the day, it’s also one of the best memories you’ll have from your B&B stay. And at Distinctive Inns of New England, there’s a good reason our acronym is DINE. You have your choice to stay at any kind of lodging choice. And we at Distinctive Inns of New England know there are times when a New England inn or B&B is not the best choice. When it is, we hope you’ll book direct with any of the fabulous inns and B&B members of the Distinctive Inns of New England. This entry was posted in advice, General, hotel, Romantic Getaway and tagged advice for romantic getaways to New England inns, Airbnb, differences between B&Bs and Airbnb, hotels, inn breakfast, inns vs Airbnb, lodging choics in New England, New England B&Bs, New England inn breakfast, New England inns, New England lodging by DINE Blogger. Bookmark the permalink.